Digital marketing makes marketers, the ability to target specific consumers and it is increasing greatly over time. Through the latest technologies and inventions, it is now possible to track individual consumer across time and even across devices. But to stay on top of the market with the ever-evolving digital trends and technologies is really hard for every digital marker. 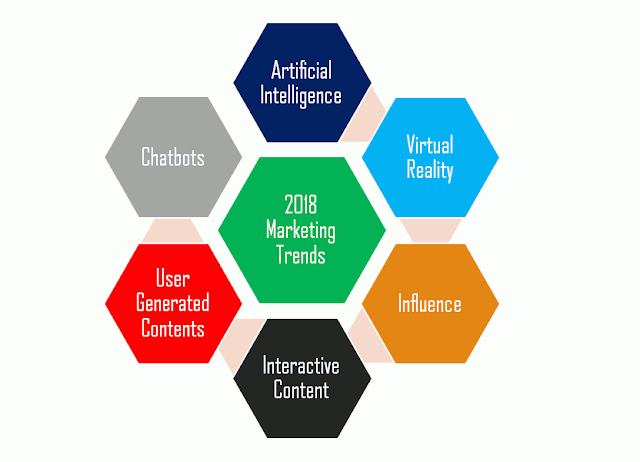 Based on research of 2017 marketing trends, here are 11 top digital marketing trends that will help digital marketers to stay tuned on 2018. When owning a business you have to think of all the ways of marketing your products and services. You must know the current trends in the market in order to stay on top. Understanding consumers’ marketing trends in this day and age are very important. In order to be effective in marketing, you must know your consumers, what they want and what they are searching for. When you understand marketing trends and how they vary then you can position yourself well. The key is to provide customers with what they need. By understanding customers’ needs you can organize your digital marketing campaign around their needs. This type of target marketing produces great results. Marketing and its effectiveness are ever-changing in this day and age. So, what worked yesterday will not necessarily work today. You must keep up with the ever-changing markets of today. Today there are more ways than ever for marketers to reach people, but brand created content is largely ignored by consumers. It is the billions of social posts real people create every day that others want to engage with. This is user-generated content buried within it and these are the most authentic trusted and relevant brand experiences that people create which brands cannot manufacture. Using user-generated experiences you can discover the best social contents from many different sources from anywhere around the world. It automatically curates and tags posts and manages content permissions and gives you the power to associate contents directly with your brand and products. With just a push of a button, you can showcase trusted user-generated content everywhere your customers encounter your brand from website to email and everything in between you and your customer. You might have seen virtual reality headsets everywhere. Whether it might be Samsung or Google, everyone is getting used to virtual reality. Some companies are even spending billions of dollars for accruing people within this source. Companies are integrating virtual reality into their marketing. If you think about e-commerce there are all these products. Why cannot it be where you actually see these products or see yourself trying them on? That’s what is going to happen with virtual reality. You are going to be able to go there, look at the products, feel, and touch them. You may not get the same sensation that you would feel in real life, but eventually, some of those feelings will start coming over through the web as they develop these technologies. 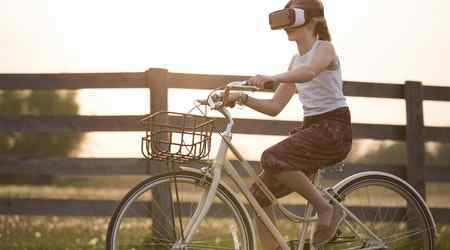 That is how virtual reality is going to affect online marketing. In essence, they’re going to take real-life experience and show them to you online. Interactive content is content that responds to a user’s activities online. So, whether they are using the arrow keys to move graphics or visual, through the screen or alternatively using the scrolling function on the mouse. It is a great way to stand out from the competition in your market. This type of content uses thing such as animation, graphics, text, video, audio, and much more. So, if you are thinking of using it for your own content or marketing strategy, what are the benefits? You get better audience involvement or engagement with your site. Your content that stands out from the others. You get greater social engagement shares and traffic. You will be able to increase your brand exposure. So, let us quickly look at the interactive content marketing stats that will help the markers to understand better. 93% of marketers agreed that interactive content is effective in educating its buyer. 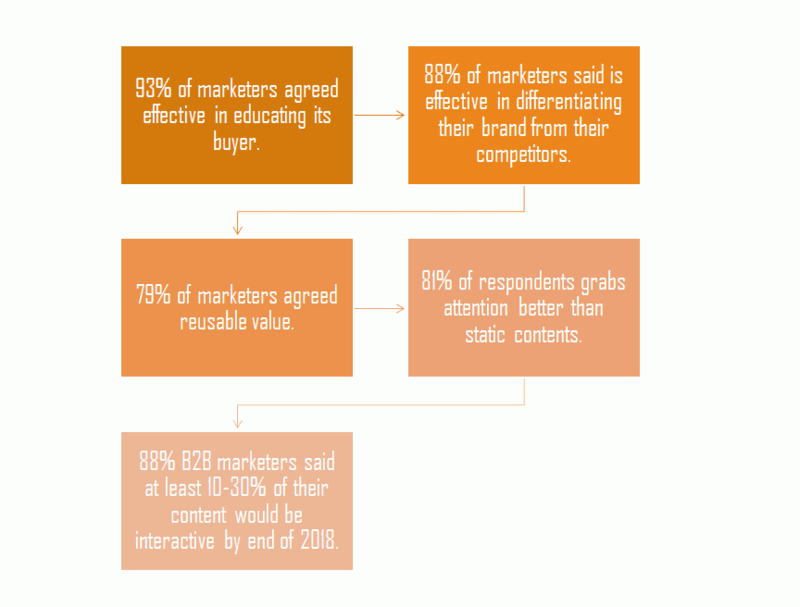 79% of marketers agreed that interactive content can have reusable value. 81% of respondents agree interactive content grabs attention better than static contents. 88% B2B marketers said at least 10-30% of their content would be interactive by end of 2018. The time for spreadsheets is over. Google search, a passport scan, a barcode reading in the supermarket, your online shopping history, CCTV footage, a photo, of a sandwich, a voice message, a tweet. All these contain data that can be collected analyzed and monetized. Supercomputers and algorithms allow making sense of increasingly larger amounts of information in real time. In less than 10 years CPUs are expected to reach the processing power of the human brain. A survey done by the Global Agenda Council on the future of software and society shows that people expect artificial intelligence machines to be part of a company’s board of directors by 2026. So, there is a good chance that in 8 years your job is going to be performed by computers. With the growth of mobile, voice search is growing fast. In fact, 20% of searches across the Google and Android devices are currently voice. With the use of Siri, Cortana, Alexa, and the Google assistant, voice search is going to impact the search industry in a very big way. There is going to be longer search queries. Like instead of just a couple of keywords typed in search engines, people are going to say the complete statements or asking complete questions instead. There will be more questions like who, what, how, when and where. Those questions are going to indicate intent. Voice search is more likely to be local. So, people are going to be looking for something in their local area. As a result of audio format, it is going to become even more competitive and expensive as well. Companies have to start thinking about creating chat bots for their companies. Every company has to have Chatbots. Chatbots are software programs designed to manage customer communications. While Chatbots can provide powerful benefits to many areas of the business. Leverage Chatbots to qualify and hand off or even close sales opportunities. 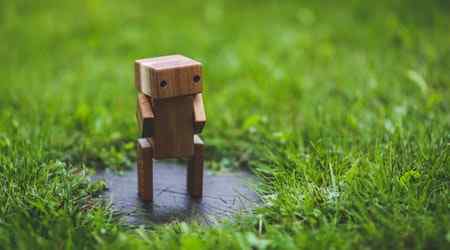 Chatbots as payment tools to manage customer transitions. Chatbot takes new prospects through a lead qualification process. Personalize your customer experience and increase their engagement. Chatbots can provide a more personalized way for your brand to engage with your customers. Chatbots can actually make conversation with your customers and prospects, increasing activity and loyalty. Chatbot can collect efficient data for your business. It is an artificial communication with your customers without directly selling them your products or services by providing consistent unique and valuable information to your potential customers. You should make your visual content like visual storytelling, should know how you can leverage all of your social media outlets by publishing unique and impactful content daily or regularly. You should curate visually compelling infographics and dynamic videos to attract, acquire and engage your target audience. Keep the right content to your user at the right time. The rise of digital content over the past few years has resulted in two fundamental changes in the B2B buying process. Buyers are more empowered and well informed than ever and the number of stakeholders involved in a tech purchase has increased. This creates a challenge for B2B companies that are trying to identify and reach out to relevant stakeholders within a customer organization. In most organizations, marketing and sales teams are siloed with little transparency into what each other is doing. This can cause a lot of wasted effort. Influence marketing affects every decision you make from what you eat to what you buy? Your decisions are influenced by recommendations from people you trust. Before, blogs and social media, the influence was limited to your friends and family. But, today your brand can reach tens of thousands of people using influences who have large targeted audiences by providing truly meaningful content. Marketers should know that traditional methods do not work anymore. Instead, consumers engage with content that matters to them. Content created by influencers. In fact, it’s been proven that influencer marketing delivers 15 times the ROI of other channels. And you should make your brand heard from identification and selection of disclosures and payments. 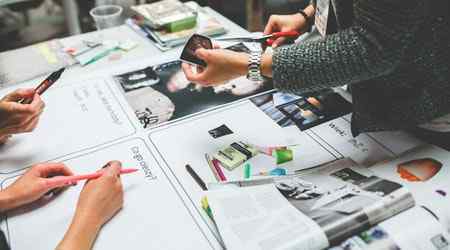 Experimental marketing techniques have taken the world by storm with its immense possibilities and the internet returns for the users. It has graduated from the original techniques of distributing candy bars, snacks, and a variety of other products to include extravaganzas to engage customer’s big time. Overwhelming media proliferation has proved to be the biggest reason both offline and online in the development of provincial strategies. Today there is a need to go beyond simple brand awareness to include the creation of relationships and experiences. In order to bring down the defense mechanism of your target group, it is today necessary beyond traditional techniques and creates chemistry with face-to-face interaction. Moving logistics and people with a focus on one - three day periods will give results. The above digital marketing trends have been listed based on the trends researched from 2017. You should always keep yourself up-to-date and research the marketing trends and technologies in order to stay on top to meet your marketing goals. This is very informative .. Thanks for sharing .. Staying up to date is one of the key factors that every digital marketer should really have to and your collection is really good. Great anniversary useful article. Good collection. But I think chatbots and user generated contents will have greag inflinflu on digital marketing. Thanks Martin for revisiting my blog and also for your motivating words. Thanks Clark for kind and inspirational words. Do visit my blog regularly. Thanks Linda that you found the piece helpful. Also do support by shearing my posts. Search Engine Technology has developed new capacities to crawl various file formats including PDF, flash and some others. This article will teach you how to optimize your PDF documents for top niche backlinks rankings on Google and Yahoo. It will also guide you on how to generate more traffic through your PDF documents. Thank you very much Johny for your words of inspirations and also that you found my posts helpful and resourceful. Your words made my day. Keep visiting my blog.